This is an example of Tab View inside Navigation Drawer / Sidebar with React Navigation in React Native. We will use react-navigation to make a navigation drawer and Tab in this example. 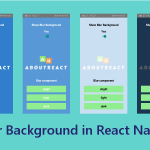 I hope you have already seen our post on React Native Navigation Drawer because in this post we are just extending the last post to show the Tab View inside the Navigation Drawer. In this example, we have a navigation drawer with 3 screens in the navigation menu and a Tab View on the first screen of the Navigation Drawer. When we open Screen1 the Tab will be visible and on the other options, this Tab will be invisible. In this example, we will make a Tab Navigator inside a Drawer Navigator so let’s get started. To start with this example you need to create a directory named pages in your project and create three files Screen1.js, Screen2.js, and Screen3.js. This files will be the Navigation Screens of the Drawer Navigator. We will create a Tab in Screen1 so we will make a directory called TabPages inside pages directory and will create 3 files HomeScreen.js, SettingScreen.js, and TabHelper.js. Open pages/TabPages/TabHelper.js in any code editor and replace the code with the following code. 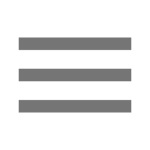 Open pages/TabPages/HomeScreen.js in any code editor and replace the code with the following code. Open pages/TabPages/SettingsScreen.js in any code editor and replace the code with the following code. 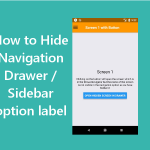 This is how you can add Tab View inside Navigation Drawer / Sidebar with React Navigation in React Native. If you have any doubt or you want to share something about the topic you can comment below or contact us here. There will be more posts coming soon. Stay tuned!